Cologne, Germany, 2017-Dec-27 — /Travel PR News/ — Every year people all around the world are awaiting a visit from Santa Claus. This year, instead of taking his usual reindeer sleigh, Santa Claus boarded Lufthansa’s first flight to ever depart Kuusamo. The flight is scheduled to arrive in Frankfurt, the airlines largest hub, where Santa Claus can connect to over 106 countries and deliver his presents on time for Christmas. 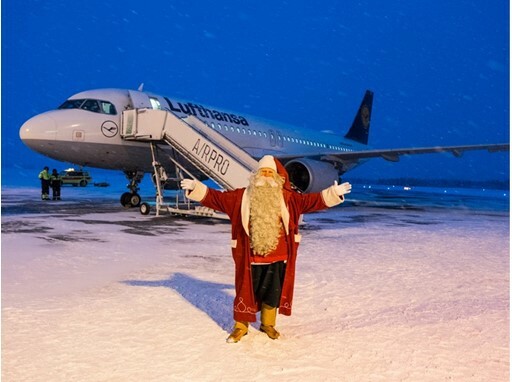 Prior to departure, passengers and crew members took photos with Santa Claus on the snowy tarmac before he stepped inside the Airbus A320. Santa Claus decided to begin his travels this year with the best and only Five Star Airline in Europe. This entry was posted in Airlines, Airports, Flights, Travel, Travel Services, Travelers and tagged flights between Frankfurt and Kuusamo (Finland), lufthansa. Bookmark the permalink.